In a couple billion years the Earth would become uninhabitable. We would need an alternate solution so we can possibly survive as a race. A common solution, mentioned by many, would be terraforming. Terraforming is turning a planet or moon into a livable habitat, with many conditions like Earth. This method might be able to provide the people of Earth a chance to live. Terraforming can save lives and provide us with a new environment, but it would take a long time to do so. This is because you need many things to make the terrestrial planet or moon into an Earth-like habitat. You would need an atmosphere, that protects from solar storms and radiation, creates pressure and it keeps the planet warm via the green house effect. You would also need oxygen and many other elements for survival. Knowing what we need is necessary, but we need to find a good place to start. A planet that is talked about in the world of science would be Mars. Mars, according to scientists, could soon be our new Earth because it has many qualities we need for survival. However, the most important thing that Mars currently lacks is a thick atmosphere. Not having this thick atmosphere causes it to be cold, as you can see from figure 1 the average temperature on Mars is -120 Celsius, which is -140 Fahrenheit. The warmest Mars ever gets (-20 Celsius, or – 4 Fahrenheit) is considered to be a cold day on Earth. Also because Mars has a thin atmosphere, the pressure is so low that the water would boil (which is a problem for people). The low pressure makes it hard for humans to live because all of your liquids would boil. Figure 1: A description of Mars’ temperature to Earth’s temperature. Though it lacks a thick atmosphere, Mars does have polar ice caps. These polar ice caps can help build a pressurized atmosphere. They contain carbonated water that that once melted, would form liquid water and also release carbon dioxide thus add pressure if we could trap it into a closed container or a bio-dome. This bio-dome can be turned into a man-made eco system. If the bio-dome was made out of glass it could also heat from the inside like a real greenhouse. The greenhouse effect is a natural way of keeping the Earth warm, it takes the heat from the sun and it traps the heat causing it to become warm. Now that we can make warmth and pressure we only lack oxygen to breathe. 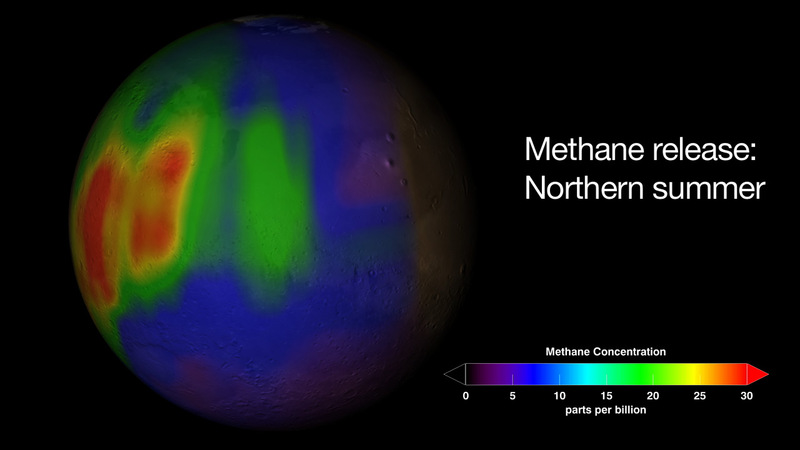 The atmosphere that Mars does have is composed of 95% carbon dioxide. If we had plants, it could convert the carbon dioxide into oxygen. With the help of the Sun the plants could produce oxygen via photosynthesis. The equation used to convert sunlight to oxygen is: 6 CO2 + 6 H2O → C6H12O6 + 6 O2. Also, if the bio-dome succeeds we would have carbonated water. This water can help aquatic plants thrive. Having plants could also start a food web that could feed us. An example is an insect eats the plants, another animal eats the insect, and we eat the animal that eats the insect. If the aquatic plants were to be placed in the bio-dome, they would produce oxygen that can build up and would produce a pressurized oxygen chamber in which we can breathe. Also, it would then push out the extra water inside of the bio-dome. See figure 2 for an example of a bio-dome. Figure 2: How a bio-dome, on Mars, would work and look. The green spots are the aquatic plants and the bio-dome is filled with water from the melted polar ice caps. Though Mars may seems like a really good option, there could be other places. Such a place could be on a moon, or more specifically Jupiter’s moon Europa (See other post: Europa by Zach Williams). In conclusion, the idea of terraforming other terrestrial places is great. It can only support our chance of survival, and will give us a chance to explore other planets. 1. 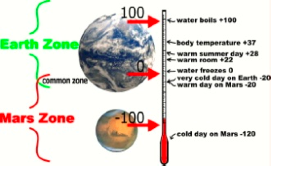 How does temperature of Mars differ from Earth’s on a warm summer day, based on figure 1? 2. What makes Mars a really good option, and what does it lack, that the bio-dome provides? 3. What are some important aspects in having an atmosphere? 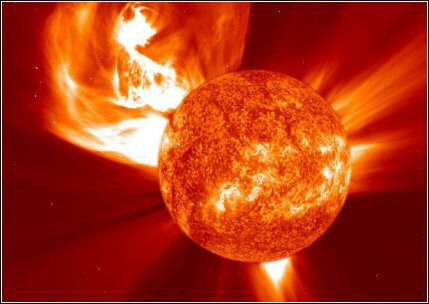 The largest solar flare is expected to occur December 21, 2012, and rumored to be the center of the whole ‘2012-the world is ending’ fiasco. Just kidding! But now that I have your attention, solar flares are merely the Sun releasing massive amounts of gas, plasma, and high energy light into its atmosphere. The gas and plasma falls back into the Sun, but the high energy light are the solar flares we can see. The frequency of solar flares varies, from several per day when the Sun is “active” to less than one every week when the Sun is “quiet”, following the 11-year cycle. Figure 1 shows the Sun at ten different phases over the 11-year cycle where each picture is the next year to the previous picture. In the picture, solar minimum is where the Sun is a darker shade. Solar minimum is when the Sun has less activity, and during this time solar flares wouldn’t be as likely as when the Sun is at solar maximum which is the brighter parts of the graph. During solar maximum, Earth is most likely to be affected by solar flares and CMEs. You’ll learn more of CMEs in the next paragraph. 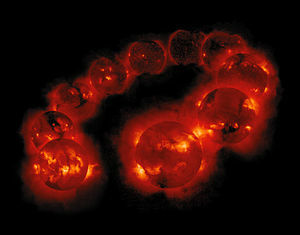 Source: http://en.wikipedia.org/wiki/Solar_cycle, credit:Yohkoh mission of ISAS (Japan) and NASA (US). This figure was taken by Yohkoh, a Japanese X-ray telescope, from the approximate 1992 to 2001 (starting from the left moving clockwise). The brighter spots in the image the more x-rays emission off the surface of the Sun (i.e. solar flares) and the less amount of light on the Sun means no solar flares created. Large flares are less frequent than smaller ones. Large solar flares really only harm humans at high altitudes or astronauts due to the strength of our atmosphere. CMEs, or coronal mass ejection, affect technology to great extent, but not humans. CMEs and solar flares are not to be confused. Solar flares are known for shooting intense light from the Sun and really only gives out radiation; CMEs are particles. Not all solar flares produce CMEs and not all CMEs accompany solar flares, but they usually occur together. Solar flares don’t really do any damage to Earth, but CMEs have the power and intensity to shift Earth’s magnetic field. Together, solar flares and CMEs create geomagnetic storms that cause charged particles to slam into our atmosphere. They affect the Earth via “Faraday’s law”. “Faraday’s law” is when an object (in this case, the CMEs) moves a magnetic field (Earth’s) and generates an electric current in nearby conductive materials (high voltage objects here on Earth). So, CMEs intense particles hit Earth and affect our telephone wires, electric generators, etc, which aren’t made to carry additional currents so they often break when this happens, which is what leads to the mass blackouts. The good thing is that your cell phone, iPod, laptop, and other small devices would not be affected by CMEs, but the reception wouldn’t work and once the battery dies, you would not be able to charge it. September 1st and 2nd, 1859 is known for the largest recorded solar storm to date. The light from aurora borealis, also known as the Northern lights, was so bright people mistook it for Sunrise. All over Europe and North America telegraph systems failed. Some shocked telegraph operators. Some telegraph pylons threw sparks and paper spontaneously caught fire. Yet, some seemed to continue to send and receive messages even while disconnected from the power supply. Scientist fear that late 2012, early 2013, will be really be the next “Perfect” solar flare. Due to our advance in technology, we would be more affected by this great solar flare with greater outcomes than just a few sparks. Watch out. 1. According to Figure 1, would our Sun now (in the year 2012) be closer to solar minimum or solar maximum? 2. Describe the difference (in your own words) between solar flares and CMEs. 3. Due to the all the information that you know now, what do you think will happen if and when Sun emits the next “Perfect” solar flare (in your own words). In my recent post, I discussed the transit method and how it is used to detect extrasolar planets. The transit method is one of the most popular methods, but so is the radial velocity method. The radial velocity method is similar to the transit method, but is used to find different characteristics of the extrasolar planet. By using the radial velocity method, astronomers can determine the mass of the extrasolar planet. We know that the planet exerts a gravitational “tug” on the star; this tug causes the star to move. Because we know the stars so well, we can look at its spectra. This spectra is like a map of the colors of light the star emits. Sometimes colors are missing in the spectra because atoms in the star use the color to gain energy. In figure 1, if you look at the top panel of the spectra you can see the missing colors. By watching the spectra you can see the star’s motion, towards or away from you, caused by the extrasolar planet. The spectra is then used to see the Doppler shift. Everyone has heard the Doppler shift when a police car flies past you with its siren. When the police car is coming towards you, its siren is higher pitched. When it is going away from you the pitch lowers. The Doppler shift in light is similar, when the object emitting light is coming towards you it looks as if it is full of higher pitched light, which is bluer. When the object emitting light is going away from you it is full of lower pitched light, which is redder. 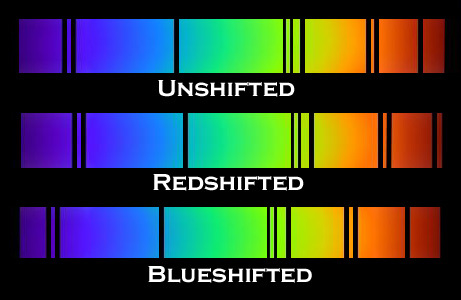 These shifts are called the “blue-shift” and the “red-shift”. In figure 1, if you refer to the second panel you can see the “red-shift”. It is red-shifted because relative to the top panel, or the unshifted spectra, it is shifted towards the red part of the spectra. The third panel shows the “blue shift” because the spectra is shifted towards the blue part of the spectra. The cartoon below shows how the red-shift and blue-shift is seen when the object emitting light is moving towards and away from you. If you use the blue-shift and red-shift, you can determine which way a star is moving. If the shift is in the blue, the star is moving towards you and if it the shift is red, it is moving away from you. This movement, or Doppler shift, can also determine the mass of the extrasolar planet. You can determine the mass due to the size of the shift. If you have a bigger doppler shift, the star has a bigger movement. This bigger movement means that the star was “tugged” harder. It was “tugged” harder because the heavier planets exert more gravity. So, if you have a bigger doppler shift, you have a heavier planet. If you combine these two methods (the transit and radial velocity method) of discovering extrasolar planets, we can determine the planet’s distance of orbit, size, and mass. Both of these methods can be used to isolate certain characteristics of the extrasolar planet. By isolating characteristics from the mass of the planet found in the radial velocity method and the size of the planet from the transit method, you can figure out what the planet is made of! If it is small and heavy, it is most likely made out of rock and water, like Earth! If it is very big but light for its size, it is most likely made out of gas, like Jupiter! 1) If a star has a blue-shift, what does this mean about the star? 2) If my hypothesis was “all doppler shifts seen in the light spectra are caused by extrasolar planets”, can you think of an example of when this hypothesis would be incorrect? 3) In figure 1, explain why the second panel is red-shifted.